As key stakeholders in the construction industry, builders, renovators and property owners have to continuously keep themselves updated on the constant changes being made to the NCC and the BCA so that they remain compliant. Grip Guard Non Slip explains the recent changes made to floor safety requirements that impact on pedestrian safety. For stair nosings, the new NCC update specifies that the stair nosing’s return (down the front of the stair tread) should not exceed 10mm – previously, this used to be 25mm. 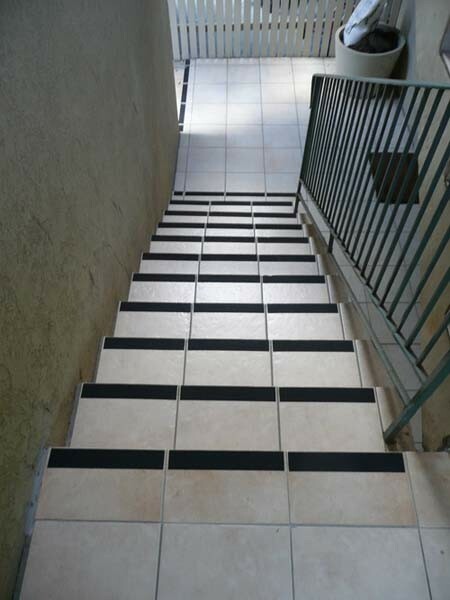 New buildings or major renovations are required to comply with the new rule for stair tread nosings. Though the required slip resistance has not changed, the type of rating has changed from a ramp slip rating to a pendulum slip rating. Additionally, the required slip rating will depend on whether the stairs are internal or external. There must also be a minimum of 30% luminance contrast between the stair treads and the stair nosings. An important change in the BCA is the new requirement that residential stairs be slip resistant; this was only applicable to commercial buildings in the past. The recent changes prescribe a P4 or R10 slip resistance for internal timber stairs in private residences; failure to comply will result in the owner being unable to obtain their occupancy certificate. This slip resistance can sometimes be difficult to achieve on sealed timber, marble and high gloss tiles. However, Grip Guard offers floor safety solutions for almost any pedestrian flooring.